Q&A with Wong Mei Inn: What’s hot on eBay Malaysia? We've been busy! For the past few years, we were very focused on helping our existing sellers (majority of them are merchants with more than 5 years eBay experience in selling cross-border) to build and grow their business. 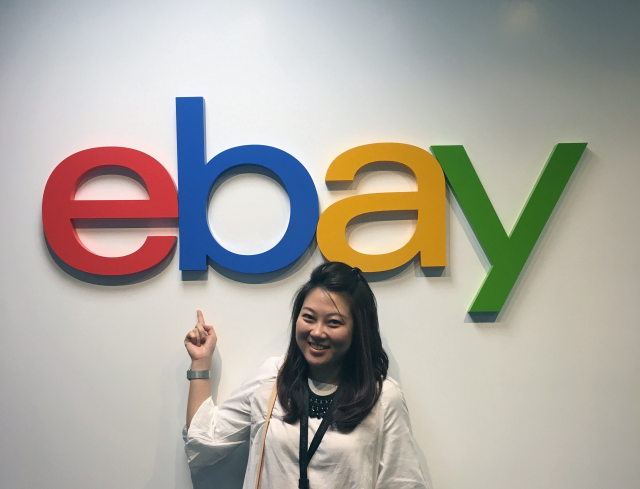 It seems to many that eBay has been relatively 'quiet' in Malaysia, so it is our pleasure to have a chat with Wong Mei Inn, CBT Country Head of eBay Malaysia. During the interview session, she has also shared many interesting pointers on why auto-parts is one of the good opportunities for Malaysian merchants to sell cross-border, so read on to find out! What’s up with eBay Malaysia? We wanted something which has more personal touch, that's why we were hand-holding some of the sellers, provide consultation for them on how to run the business and give them all the support to help them grow their businesses on eBay. That sums out the strategy for the last 3 years. Did you know, that some of the Malaysia sellers have seen more than 100% growth (year-to-year) selling on eBay (mainly to US, UK or Australia)? Most people thought we were a bit 'quiet', but actually we were working hard behind the scene on a pretty lean team, just that we were not active in the public scene... but we are back! 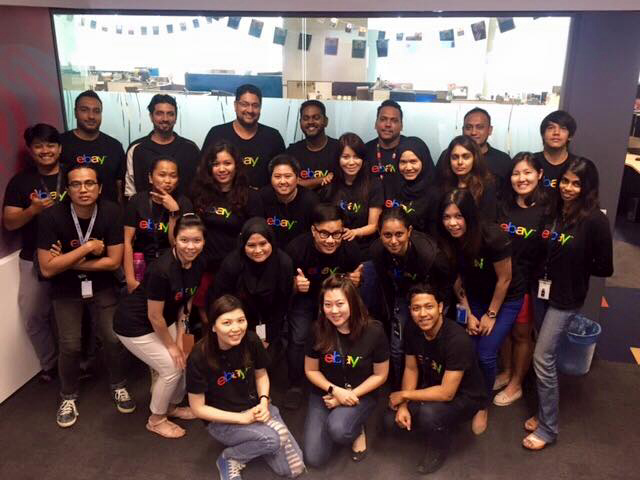 How big is eBay Malaysia team? eBay has been around here for 3 years now. 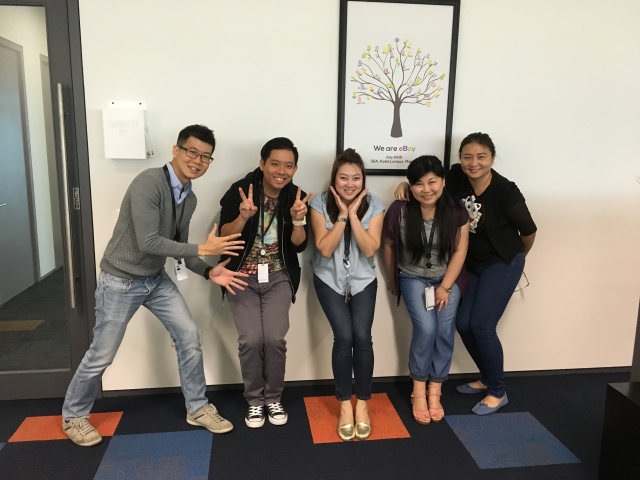 The recently established South East Asia (SEA) customer support team is about 30 plus people. The team cover the support for Thailand, Singapore, Indonesia, Malaysia, Philippines and Vietnam, and we are hiring more! Apart from SEA support team, there are team here taking care of various functions, from biz development, product integration, to account management. What has changed since PayPal spin-off? Will eBay support other payment options besides PayPal? The split up is better for both company. As eBay can be more focused on merchants now. There is higher synergy as well, as both companies can now freely pursue more opportunities. This decision made by top management is really good for both companies to move forward for bigger and bolder opportunities. On customers side, nothing much impacted (pretty much status quo). 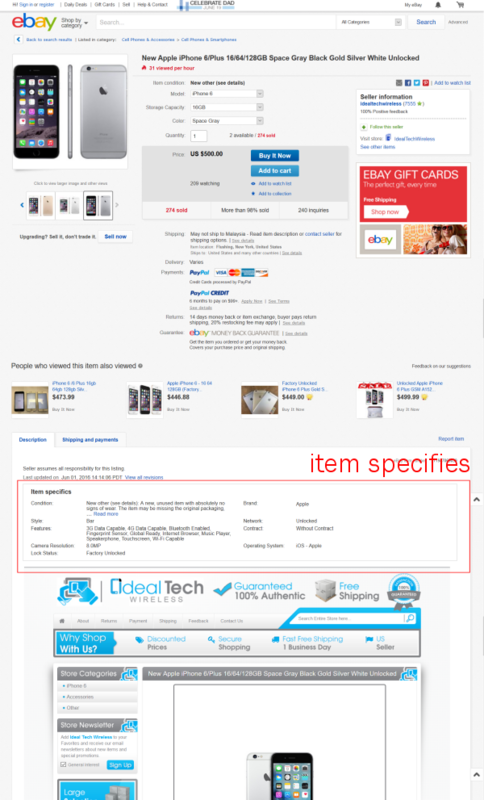 The buyer and seller protection is still there (enabled by eBay + PayPal). Both companies still work closely to give the best product and services to the customer. On cross-border selling, before or after the split, merchants still have to use PayPal. As for eBay Malaysia (local site for Malaysia market), we do consider adding in more payment options in the future to support the local consumer purchases. What will be the key focus for eBay in South East Asia, in particular Malaysia? You know... out of the six South East Asia countries, only Malaysia and Singapore have local eBay sites. So the SEA customer support team need to support both sellers and buyers from all six countries. Regionally, the focus is actually on Malaysia now, as the growth opportunities is the greatest among all. Did you know the growth is the highest in Malaysia compared to other SEA countries? While other countries in average score a double-digits growth, on Malaysia we observe more than 50 % in Gross Merchandise Value (GMV) growth in cross-border selling in 2015. The fast growth is a surprise to us too, we didn’t really expect this kind of growth rate, last year was really a great year for Malaysia. Thus eBay decides to dedicate more focus and resources in Malaysia now to drive more growth. Good to hear that! E-Commerce has recently become one of the key focus area for the nation growth, so what kind of business activities is eBay planning for Malaysia? Firstly, we are going to scale up our efforts in new sellers acquisition, especially on merchants selling products within our focus categories. Secondly, seller education. We will educate the existing sellers (walk them through the best practices), and some of the latest policies changes that might impact the sellers. We want to make sure they know what to do and how to expand their business in eBay. On top of that, we will also run a nationwide brand awareness for eBay, educating merchants (of all sizes) that they should explore beyond just domestic market, we want them to use eBay to sell overseas! This is a platform to bring their business to another level - think higher visibilities of your products, think about selling to global buyers and making money in US Dollars! I guess some people might perceive eBay wrongly, they don’t fully understand how eBay works (some still think we are just an auction site). Many don’t really realized how big the potential they can grow with eBay. Also, did you know eBay is 21 years old now? 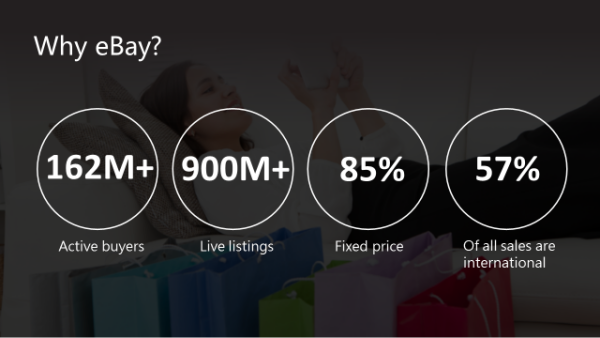 Here are some of the latest stats about eBay, imagine you can buy like 900 million items on eBay at any point of time, we have about 162 million buyers and 25 million sellers worldwide! How can Malaysia merchants or brand owners tap into eBay's huge global user base? To be able to sell to global customers, basically sourcing is always the key. The insights (pricing, competitors offering etc) of the market is something you really need to grab hold of. And you have to ask, are you a global trends chaser? Are you selling something unique? 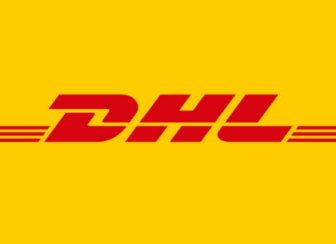 Then you got to have infrastructure like logistic to back you up, there are a few reputable carriers you can work with in Malaysia, for example DHL ePacket, Aramax, FedEx. On smaller ticket items, you can consider using POS Malaysia registered mail. As you grow, you might need more people or better tool to optimize your product listing , that you need to make sure you have the right keywords in the title, fill up the contents for item specifies (see screenshot below) and upload higher quality product pictures. Besides, providing FREE shipping is also important. And of course, quality products (not just quality pictures per say). If you do these few things well, I am confident that you stand a very good chance to be successful in eBay. Can you share with us on the program eBay is working with MATRADE Malaysia, in order to support SMEs in Malaysia on cross-border selling? Of course! 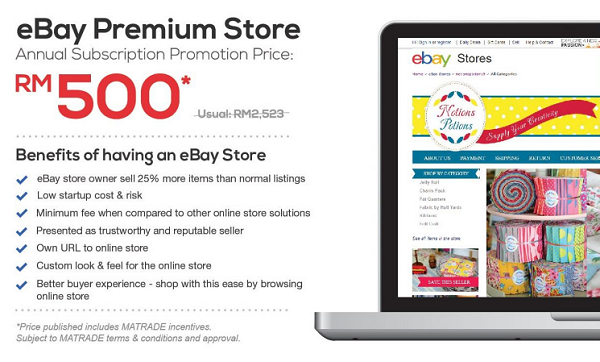 Earlier this year we have launched eTRADE program with MATRADE, each party will subsidize RM1,000 for qualified SMEs to sign up an eBay premium store worth RM2,500. With this subsidy, you only need to pay RM500 to start off! You can find out more information about eTRADE here. What type of tools or data are available on eBay to help the sellers? If you subscribe to the eBay premium store, you will have access to marketing tools like Selling Manager Pro, with some advanced features which reports your monthly profit and loss, your product success ratio, average selling price etc. Then there are also 3rd party tools we recommend like Terapeak, from there you can find out about best items sold, amount of items sold etc. Of course the best way is to conduct a research on eBay.com itself, looking at the products that your competitors (or the same category sellers) are carrying, the market research counts! Can you share your top verticals for cross-border selling, as far as Malaysia export potential is concerned? 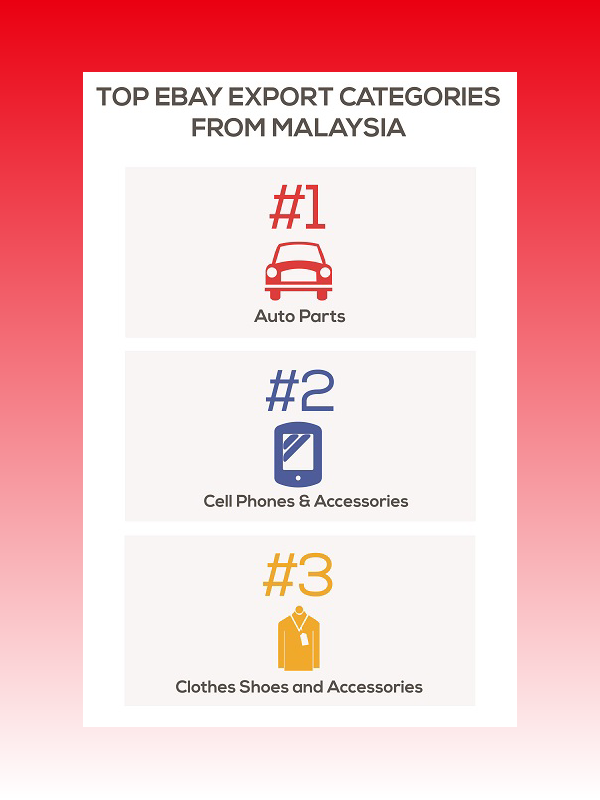 The top categories are Consumers Electronics, Auto Parts, Clothes, Accessories & Shoes, Collectibles and Sporting Goods. The fastest growing category now for Malaysia CBT is still Consumer Electronics. However, the long tail products (stable) is definitely the Auto Parts. This is one of the key areas we think Malaysia merchants have huge potential and upsides. 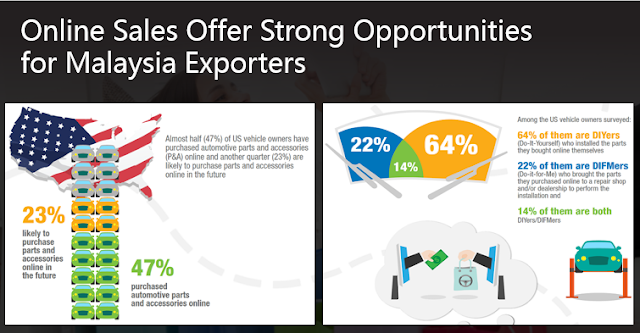 Can share more on the opportunities for exporting auto parts via eBay? In Malaysia, there are a lot of auto parts manufacturers, we also import and export auto parts. Many of them be it manufacturers, retailers, traders, they keep a lot of stocks, some of them might be 'dead stocks'. Dead stocks is bad for business, eBay can turn that into cash! So via eBay, it is a good opportunity for them to open up an online channel to clear some of their dead stocks, and they can also explore selling new or second hand auto parts. And it’s not just for autoparts, don’t forget other categories like motorbike parts, internal or external car accessories, in-car audio, video entertainment etc. These products also sell very well in eBay Motors hence great opportunities to tap into. Why is it auto parts? Should merchants sell old or new parts? To put in simply, eBay Motor is one of the biggest auto platform in United States! There are many in the States who like to DIY, as mechanics (human labor cost) are costly. People resides in US generally have an habit of DIY-fixing their cars themselves, hence they would not hesitate to buy car parts (especially Japanese car parts) online from countries like Malaysia, as long as being priced competitively. On new or old parts... it is definitely easier to sell new parts, but old parts will give you better margin, just more work is required (as each item you need a new set of pictures). How to be successful selling auto parts via eBay? Let me think, the knowledge on compatibility of the parts is fundamental. The after-sales service is very important (as this is very technical, you need to know the compatibility of the parts with the exact car models). Try to carry ready stocks always, plus fast reply (to enquiry) and fast shipping! Again, don’t forget that Japanese car parts is one of eBay's strengths. What other things to watch out on auto parts CBT? Your probably want to start with any auto parts products below 20KG for now, where as the cost of shipping is still reasonable, unless you stock your products at warehouses in the destination country. Take caution that liquid is not allowed (air-freight liquids is not allowed), so you can’t really sell lubricants if you were to ship it from Malaysia. Sounds good, where and how to start? We are planning for workshop tailored for car parts, car accessories sellers and educate them on how to kick-start their eBay business. We are going to share with them the best practices on how to make it a success online! We are targeting to sign up 300 new auto parts sellers in year 2016 & 2017. Cool, any message for our readers to wrap this up? To all aspiring merchants and brand owners, check out eBay, get in touch with us and start selling cross-border now! Cheers! ecInsider: Q&A with Wong Mei Inn: What’s hot on eBay Malaysia?